The Boston Herald featured an article on March 12, 2015 by Moira McCarthy about Jackson, NH and mentions the Inn at Ellis River: “The lodging choices in Jackson offer something for anyone… Looking for a cozy B&B? The Inn at Ellis River offers plenty of room, an amazing breakfast and the lovely sound of a babbling brook.” Gastrotraveling.com’s Skiing Mecca in Jackson New Hampshire, February 13, 2014, by Steve Mirsky featured photos and some of the comforts at the Inn at Ellis River in their article about cross country skiing at Jackson Ski Touring Foundation. Tripatini.com’s Cross-Country Skiing Mecca in Jackson, New Hampshire, March 4, 2014 and Virtualtourist.com’s Skiing Mecca in Jackson New Hampshire ~ Jackson Travelogue by gastrotraveling, March 3, 2014, published similar features by Steve Mirsky. The Inn at Ellis River is shining example of a distinctive door-to-trail skiing experience in Jackson Village. Historic yet comfy rooms overlook the Ellis River from a wide deck spanning across the back. Husband and wife team Frank Baker and Lyn Norris-Baker offer gracious hospitality with lavish breakfasts, warm common areas, and their own pub down the hall from the dining room complete with tufted leather chairs, billiard tables, as well as signature cocktails that Frank shakes up himself. Inside their solarium, you’ll find a jacuzzi accompanied by a 2 foot tall rubber duckie Frank and Lyn entered in Jackson’s Annual Wildquack Duck River parade held every spring. Boston Herald’s Quaint Jackson Full of Fun for All, January 09, 2013, featured the Inn in their article about skiing at Black Mountain. Try the Inn at Ellis River, a lovely bed and breakfast with rooms for romance… There’s gourmet breakfast, plenty of fireplaces, a game room, a hot tub, a full-licensed pub and a friendly, homey feel. Moira McCarthy. p. 40. BnBFinder.com’s B&B’s are Leaping to the Occasion, February 29, 2012 featured The Inn at Ellis River’s Leap Day Elopement Package with a free two night honeymoon. BedandBreakfast.com’s Top 10 Mountain Escapes, Fall/Winter, 2011 featuredThe Inn at Ellis River as the B&B for Mountain Escape #5: Jackson, NH. Jackson sits in the White Mountain National Forest, and there are endless activities here all year long… New Hampshire To Do, Jackson’s Community Christmas… Traditionally Yours, December 2011. If “It just doesn’t seem like Christmas yet this year”, fear not… the Inn at Ellis River has portrayed an interpretive reading of Charles Dickens’ A Christmas Carol… In a vacation destination as desirable as the Mount Washington Valley, Jackson holds the essence of what visitors to the area seek. Laura Russo, p. 20-23. Newsday. Babymoons: One Last Hurrah Before the Birth, October 23, 2011 featured the Inn’s Babymoon Package. Closer to Long Island, babymoon options abound. “We’ve gotten about six to eight pregnant couples in the last month”, says Lyn Norris-Baker, who, with her husband, runs the Inn at Ellis River in Jackson, N.H. Their “Babymoon Getaway” package includes sparkling cider, chocolates, prenatal massage and a candlelit dinner or gourmet picnic lunch. Joe Amodio. 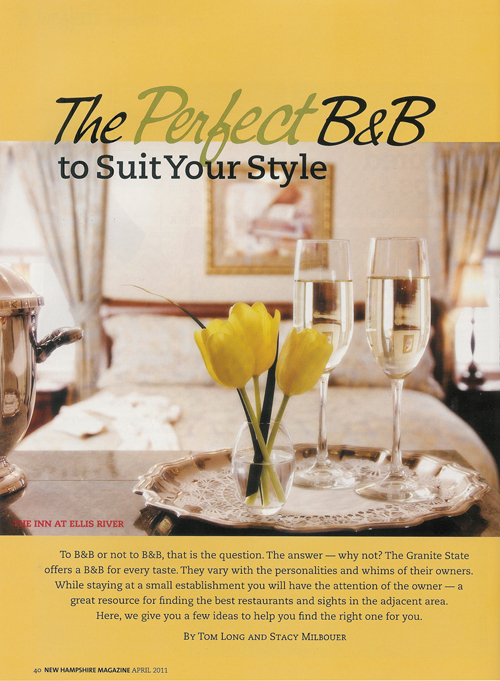 New Hampshire Magazine, The Perfect B&B to Suit Your Style , April, 2011, Fall asleep to the sound of the Ellis River nearby in beautifully appointed guest rooms all named after White Mountain waterfalls after a day of exploring quintessentially New England Jackson. Walk through a covered bridge to nearby golf courses, quaint shops and restaurants or simply stay close to home enjoying the inn’s in-ground pool in warmer months and hot tub year-round. At the end of the day, the pub and game room beckons for a rousing game of pool or darts and refreshing libation. Tom Long and Stacy Milbouer, p. 41 The Providence Journal, Enjoy a Weekend Stay at a Cozy Country Inn, December 19, 2010. After a soak in the bubbly tub waters, overlooking a snow-banked river and mountain range backdrop, we headed to the inn’s welcoming pub for drinks and a game of pool. Modern meets rustic at this onetime 1893 farmhouse filled with period antiques and original paneling and woodwork in Jackson, NH…You can’t go wrong with any of the 22 rooms, all with featherbeds, TVs and DVDs, but 17 have working fireplaces – perfect for cuddling and warming up after a day spent playing outdoors. Diane Bair and Pamela Wright, D8. New Hampshire To Do, June, 2010. The Inn was the cover girl for this issue featuring Country Inns in the White Mountains’ Inn to Inn Herb Tour. The feature article included the Inn at Ellis River’s Herb Tour recipes. The Inn at Ellis River has won three Best of BedandBreakfast.com Awards, including Best of New England 2009-2010 and 2007-2008, and Top Twelve Overall Worldwide for 2008-2009. The Best of BedandBreakfast.com Awards are based upon a qualitative and quantitative review of the nearly 50,000 independent reviews submitted to BedandBreakfast.com. We’re delighted that inngoers concurred that the Inn at Ellis River is a favorite among those seeking the B&B experience, commented Sandy Soule, a spokeswoman for the B&B industry. It’s clear that the Inn at Ellis River earned high marks from inngoers for their fine accommodations, breakfasts, amenities, and wonderful hospitality and service.October, 2008. See what guests are saying about us on BedandBreakfast.com. The Inn at Ellis River also has a ‘5’ traveler rating on TripAdvisor.com if you would like to read additional reviews. BookingBuddy.com, March, 2010. …The morning is a delight with dishes like cinnamon crepes stuffed with apple filling and orange croissant french toast with fresh strawberries. Each room is unique, and some come with whirlpool tubs or fireplaces, or both. The inn offers packages throughout the year… Kate Hamman. SmarterTravel.com, January 8, 2008. Nestled alongside, you guessed it, the Ellis River, this inn screams romantic retreat. Your hosts, Lyn and Frank, welcome you with home-baked cookies and 24-hour coffee and tea. Lyn’s culinary talents make the morning a delight… Kate Hamman. Yankee Magazine, Winter’s Hometown: The Mount Washington Valley, January/February, 2007. Recommended the Inn at Ellis River for lodging. The quiet, relaxed, cozy atmosphere makes this a great romantic retreat… You can cross-country ski by day and relax by the fireplace in the pub by night. Mel Allen. The Boston Globe, 2007. The Inn was recommended in articles by Marty Basch and Richard Carpenter. Jetsetters.com, August 22, 2007. What could go better with fall than falling water? Escape to the Inn at Ellis River, where each guestroom is named for a local waterfall, and surround yourself with the rushing waters and scenic views of the White Mountain National Forest… New Hampshire Magazine, December, 2006. Inn at Ellis River’s recipe was featured in article on the Country Inns in the White Mountains’ Inn to Inn Cookie Tour. Rutland Daily Herald, February 2, 2006. Just entering the fragrant lobby, which was lighted by the fireplace …was like walking into a fairy tale… Our leisurely breakfast was delicious with a choice of entrees and muffins, made and served by our hosts and their helpers. The view of the Ellis River and the early skiers striding alongside it added the proverbial picture perfect touch. Karen Lorentz. Arrington’s Inn Traveler, Spring, 2005. Inn at Ellis River. Two page feature article. In addition, our guests named us to ArringtonInn Traveler’s “Best of” Lists 2003-2006 including Best in the East List 2004, Best Mountain Retreat 2005, and Best for Outdoor Sports Enthusiasts 2006. (The Magazine ceased publication after 2006). Yankee Magazine Travel Guide to New England Editor’s Pick, 2003. The quiet, relaxed, cozy atmosphere makes this a great romantic retreat. Yankee Magazine Seasons, 2003. The Inn was featured in the magazine.